Group Management is where you manage the creation and removal of groups for users and roles. This interface can also be used for adding users to groups and removing individual or multiple users from group membership. The Group Management page is located inside the Jetspeed Administrative Portlets section. The Group Management page is the third tab on the administrative menu across the top. Here you see the Group Admin which is located on the left of the two portlets displayed when initially accessing this area. You can search for a particular group by entering the group name or start of the group name in the search text box. After clicking on the "Search" button, the group listing will show the search results starting with the group that best matched your search query. Groups that are listed normally after the matched search result will still be displayed. To get only exact matches when searching for a particular group name, check the "filter" checkbox below the search text box. Clicking on the "Refresh" button will reset the group listing to the first page. Select one of the groups in the listing for editing by clicking on the group name. 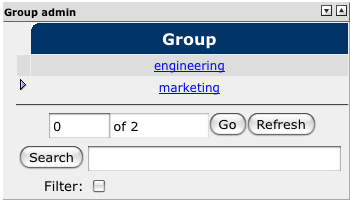 A small arrow will appear in front of the group name to indicate it is currently selected, and the group's details will be loaded in the Group Detail Information portlet. You may add a group by entering the name in the Group Name field of the Group Detail Information Portlet and clicking Save. The Group Admin portlet on the left will update to include the new name alphabetically. You can use the Users and Roles tabs to add users and roles to your new group. You may remove a group by selecting a group for edit in the Group Admin portlet. The Group Detail Information portlet will update to include an option for remove. Any users or roles that are members of that group will not be affected any other way. Adding a group of the same name will not reinstate the users or roles membership automatically. Roles and Users must be added again for them to belong to the group. The following sections are based on a group having been selected for editing as described above. Two tabbed menu's, Users and Roles, are available for editing within the group. With the Users tab active, click the "Add User to Group..." button located below. A new pop-up window will appear with a list of available users. Select the checkboxes of any user you wish to add to the group and click "Add Users". Multiple selections are possible by clicking on the checkboxes individually. The window will automatically refresh with the new users listed. Checkboxes to the left of each user in the list can be checked to select the user. Multiple selections are possible by clicking on the checkboxes individually. Click the "Remove Checked Users" button to remove the selected users. The window will update itself after performing the action. You can search for a particular user in a group by entering the user name or start of the user name in the search text box. After clicking on the "Search" button, the Users in Group listing will show the search results starting with the user that best matched your search query. Users that are listed normally after the matched search result will still be displayed. With the group selected for editing and the Roles tab active, click the "Add Roles to Group..." button located below. A new pop-up window will appear with a list of available roles. Select the checkboxes of any roles you wish to add to the group and click "Add Roles". Multiple selections are possible by clicking on the checkboxes individually. The window will automatically refresh with the new users listed. Checkboxes to the left of each role in the list can be checked to select the role. Multiple selections are possible by clicking on the checkboxes individually. Click the "Remove Checked Roles" button to remove the selected roles. The window will update itself after performing the action. You can search for a particular role in a group by entering the role name or beginning part of the role name in the search text box. After clicking on the "Search" button, the Roles in Group listing will show the search results starting with the role that best matched your search query. Roles that are listed normally after the matched search result will still be displayed.